Welcome to our guide on northern pike fishing tips and techniques. In this article were going to reveal to you some of the top tips and techniques on how to properly and effectively fish for pike year round. Fishing for pike makes for great fun and can easily and effectively be done all year round. They’re extremely easy to target if you know what you’re doing and come in various shapes and sizes. The pike has an extremely bony filet but if properly prepared can easily become a great tasting boneless fish filet. What’s even better about the northern pike is the fact that if you live just about everywhere in Canada as well as in the Northern United States, generally speaking your local lakes and rivers are probably loaded with them. Like stated earlier these fish are extremely easy to target and are very plentiful, making them a very desirable target for seasoned anglers and new anglers alike. Pike are a very aggressive species of fish which will hit hard and fast at almost any time of the day regardless of the season. They like to hide in weed beds and can often times be found between 2 and 15 feet of water. In order to properly and effectively catch pike you need to better understand the fish themselves. Pike, like most fish, are predators. Little has changed about this fish over the millennia because they are effective and adapted to completely dominate their environment. From their torpedo like shape to their needle sharp teeth this fish was designed to survive and thrive. Northern pike are great to fish year-round but there is one prime month out of the year in which they are the absolute best fish to go for, and that’s May. This is due to the fact that they’ve completely rejuvenated themselves from their earlier spawning season and in many places the ice has gone and the fisherman have started to come back out. Throw just about anything in front of them, and they’ll hit it. There are some things that you need to take into consideration prior to going out and attempting to catch northern pike. The first thing you need to remember is that you need to have a wire leader on your line because these fish have extremely sharp and piercing teeth. They can easily bite through any regular monofilament line and after a small fight will go through braided line as well. This is why you need to ensure that you have a heavy leader of some type on your line. Often times you’ll want somewhere between 20-30 pound mono line or 15-20 pound braided line with a 12 inch black wire leader on the end of your line. There is one exception when you will want to use a smaller wire leader and that is when you’re using floating plugs. The reason why you would want to use a smaller, 6 inch wire leader is because the weight of a 12 inch wire leader would greatly affect the overall action of the floating plug. Always remember that these fish were designed to be one of, if not the top fish in any river or lake. You need to ensure that you keep your distance once you actually land the fish. Do not attempt to put your hand (or fingers) inside of its mouth because if it clamps down, you’re in for a wild ride (and one heck of a story). You want to make sure that you land the fish with a net, and once you have it on board your boat or onshore, you will then use fishing pliers to remove the lure. If the fish is less than or equal to 10 pounds you can generally grab it across the back of its head right behind the eyes, right around the gill plate and effectively remove the lure. If the pike is larger than that you will want to keep it inside the net so that you have full control over the fish at all times. You want to ensure that you have a pair of needle nose pliers, the longer the better and a pair of jaw separators never hurt anybody. This section of the page is more than likely the reason why you’re here. You want to learn the tips, tricks and techniques on how to land that trophy fish. Always remember that northern pike are an extremely fun fish to catch because they put up a great fight and if you’re hungry, they’re great eating. Below you will find the information you came looking for, the tips, tricks and techniques on how to catch northern pike. Always use a net: pike are an extremely strong and aggressive fish. You don’t want to get too close if you like the way your hands look. Always use a net and a long pair of needle nose pliers every time you land one of these fish. Troll faster: northern pike are very fast fish and are more than happy to attack your lure while moving at a fast rate. By trolling faster you’ll be able to cover more ground at a more efficient rate and the faster motion is more attractive to pike. Keynote: on a sunny day use a shiny lure, it’s shininess in the water helps to catch their attention. Fish the weed beds: use a lure that rides above the weed beds such as a crank bait or a spinner. Pike enjoy hiding in these areas and when they get a glimpse of your lure they’ll attack it harder than a hobo on a ham sandwich. If you find yourself getting tangled in the weeds too much then switch lures accordingly. Keep it simple stupid (KISS): don’t over think this. Pike are a very easy species of fish to catch if you’re fishing in the right places. Northern pike are ridiculously aggressive and will hit just about anything. All you need to do is simply put your lure in front of them and prepare for impact. Bigger is better: pike enjoy hitting lures that are larger in size. An 8 inch crank bait is truly a slayer when it comes to northern pike. Generally speaking the color of the lure itself doesn’t particularly matter but you can’t go wrong using a fire tiger pattern. Some common live bait that anglers will use when fishing for northern pike include frogs, leeches, minnows, and even worms. More often than not you’ll end up using minnows as your primary choice of live bait. You want to use minnows that are between 4 and 6 inches. While putting them on the hook you’ll want to hook them directly through the head going from bottom to top if jigging or through the lip if fishing around weed edges, shorelines or drop-offs. You can either find these minnows (shiners) at a local bait store or you can use a minnow net to catch minnows native to the lake. Generally speaking shiners are readily available at most local bait shops and are perfect for pike. Most people would agree that live bait is generally the way to go. But with the northern pike, dead bait works just as good, if not better. Some of the best dead baits for pike include white fish, smelt, chubs, alewives and most people’s favorite, the sucker. The reason why the sucker is often times the most popular dead bait is because it’s very readily available at most bait shops. While using dead bait, primarily sucker fish, you’ll want to make sure that they’re roughly 8 to 12 inches long. This is because anything less than that will only promote smaller fish to hit. And if you’re like me, were only going after the big ones. One thing to keep in mind while using dead bait is the fact that you’ll want to keep your bait frozen right up until the point of using it. Once you’re ready to use your live bait you’ll want to let them thaw out about halfway or until you can get a hook through them. And remember, any bait that’s not used can simply be refrozen and used again at a later date. One of the most common live bait rigs is a bobber rig. What a bobber rig consists of is a bobber, a length of braided, monofilament or fluorocarbon line followed by roughly 6-12 inches of wire leader (depending on the depth of the weeds you’re fishing). You will then have a 4 to 6 inch minnow on a 1/0 sized hook. You’ll cast your line out in areas where you think pike will be, generally areas with weeds, and wait for one to hit your minnow. Another very common way to fish for pike with live bait is by jigging. This is where you will hook a 4-6 inch minnow through the head from bottom to top. Generally you will do your jigging in deeper water but that is not always the case depending on the type of situation you find yourself in. While jigging you will want to let your bait bounce along the bottom while occasionally lifting it roughly 2 to 3 feet off the bottom. A key tips remember while jigging this way is that pike often times strike while the bait is falling. So with every descent prepare to set the hook because these fish hit hard and fast. You can also use a drift rig which allows you to cover a large number of definable structures. These structures include drop-offs, shorelines, and weed edges. With this type of rig you will hook a 4 to 6 inch minnow through the bottom lip. Generally you’ll use a size one hook for this. One very important factor that needs to be taken into consideration while setting up a drift rig is the fact that you need to match the speed of the drift and depth with the weight of your sinker(s). You do this by starting with a single split shot and continually adding them as needed until you hit the bottom. A pro tip is that once you feel the fish hit you need to open your bail and let the fish take line for around 5 to 10 seconds. This is to ensure that the fish gets the entire shiner, including the hook, into its mouth prior to setting the hook. Simply lower your rod tip, open the bail and let the fish take line, the close your bail and set the hook. Enjoy! Dead bait rigs are generally kept extremely simplistic and easy for anglers to simply make on their own, but they can also be purchased if need be. Generally with a dead bait rig you want to use treble hooks because they do a better job of securely hooking and holding onto the fish but you can also use 1/0 partridge style hooks. Some of the best dead bait rigs for pike include; floating dead bait, wobbling dead bait and free line dead bait. Floating dead bait: this is a very simple method of dead bait fishing. This consists of simply suspending the dead bait under a float. Generally you want to use a bigger size float because pike are very strong and you want to limit their ability to take the bait down with them. With this float you’ll generally have the ability to also suspend your dead bait at various depths depending on the area in which you’re fishing. Making this rig ideal for using in both shallow weed beds and around drop-offs. A tip to keep in mind is that you should always remember to pop the airbag inside of the dead bait you are using. This ensures that the bait will not float to the top but instead will remain suspended in its desired location underneath your float. Wobbling dead bait: this type of dead bait rig allows you to continuously cast and then retrieve your dead bait. Virtually what you’ll be doing is hooking your dead bait up as if it were a lure. You’ll do this by placing treble hooks within the actual bait itself using a wire trace and then casting it out and retrieving it as if you were using any other type of pike lure. While doing this you want to ensure that the dead bait you are using is not too large. The larger the bait the more strain will be placed on the rod, the line and the reel. More often than not you will use this type of the dead bait rig where other types are not feasible. Such as fi you find yourself in a shallow river where you can’t use a floating dead bait rig, this would be your next, go to dead bait rig. Free line dead bait: this type of dead bait rig encompasses simply a wire trace, the bait, and hooks. You simply hook your dead bait to the hooks and cast out your line. Once you’ve cast out the line you simply allow for the water to take your bait and do whatever it chooses with it. Generally speaking your bait will simply float on the surface or will sink slightly below the surface. Another option you have is to pierce the air bladders within the dead bait allowing them to sink slightly below the surface. This is easily done by puncturing them with a knife or by simply standing on top of the bait prior to hooking it up. Not only does this help to make the dead bait sink, but it also allows for natural fish oils and ‘flavoring’ to seep out of the fish helping to attract northern pike. One thing to keep in mind while using this type of dead bait rig is to allow the pike to take the bait and slightly run with it prior to setting the hook. You want to let them run with the bait to ensure that they have a complete grasp on it before raising your rod and setting the hook. 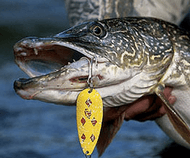 There are countless fishing lures currently on the market for pike fishing. You can easily become overwhelmed with the sheer volume of choices you have when attempting to pick the right lure for northern pike. We’ve narrowed it down to three basic lures that do wonders when it comes to attracting, and catching pike. Those three lures are spoons, soft plastic swimbaits and in-line spinners. These three types of lures come in countless color combinations and are ideal for just about any situation you will find yourself in when fishing for pike. Of course you can always find yourself a seasoned angler like Nolan over at Nolans Top Gun Charters who knows the water and the exact lures that should be used in ever situation. Plastic swimbaits: these soft plastic lures can be altered or adapted to fit just about any scenario you can find yourself in while fishing for pike. They are extremely versatile and best of all, they’re relatively cheap. When using these plastic swimbaits you’ll want to use the ones that come in the 5 to 6 inch range. While looking for the swimbaits you can very easily become overwhelmed by the sheer number and variations available on the market. To simplify this you simply need to choose a few variations of the proper sized swimbaits, but make sure that you choose them in colors that pike are attracted to. These colors are yellow, chartreuse and white. Your retrieval pattern can vary depending on the type of swimbaits you’re using. Depending on the color and shape you’ll have to decide whether you need to have a fast or slow retrieval as well as if you need long pauses or short pauses between cranks. You’ll have to mix it up and experiment to see which retrieval and swimbait the fish are attracted to. Spoons: spoons are another great lure option for pike. As a spoon falls and flutters through water during the angler’s retrieval it imitates a wounded or injured baitfish. Any angler who often fishes for pike more than likely has an extremely large collection of spoons. When it comes to pike, you’ll want to use bigger spoons. You want them to weigh between ¼ ounce and 1 ounce. When purchasing spoons for pike you want to make sure that they have a fair amount of silver or gold on them. These are extremely reflective and easily grab the attention of northern pike. While retrieving your spoon you’ll want to keep a consistent, slow and steady pace. You’ll want to ensure that you’re reeling just fast enough for the spoon to wobble allowing for the reflection and flutter of the light. If your spoon isn’t producing this fluttering action then you simply want to add a slight jigging motion while reeling. Spoons are extremely effective while fishing any kind of drop off because spoons allow the angler to easily and methodically control the depth of the spoon while fishing. In-line spinners: when it comes to spinners you’ll want to make sure that you use a larger sized spinner. If you use one of the standard, smaller spinners, you’ll only attract the smaller pike. By using a spinner you’re allowing yourself to cover a greater amount of water while searching for pike. They allow the angler to quickly and effortlessly cast and retrieve, allowing for large amounts of water to be covered in a very small duration of time. Hands down the most important factor when it comes to having an effective, pike attracting spinner, are the blades. While you retrieve the spinner the blades of the spinner rotate very quickly through the water sending out pulsations and vibrations in every direction, these also attract the attention of other fish like the crappie. Because of this you will be gaining the attention of the northern pike largely due in part to the pikes extremely sensitive lateral line. While retrieving the spinner you want to ensure that you don’t retrieve it too fast. A helpful hint is to retrieve the spinner only fast enough to keep it off the bottom or just above a weed bed. Using a spinner in early spring is an ideal time due to the fact that the weed beds have not yet grown in which alleviates and helps to lower the chances of your spinner getting stuck in the weeds. In-line spinners come in countless variations. You can find them dressed in elaborate rubber skirts, but you can also find them dressed with natural materials such as feathers or buck tail. Our recommendation is to get a few different colors that pike are generally attracted to such as yellow, chartreuse and white. Make sure you get a spinner that is between 1/6 and 1 ounce in size, the bigger the spinner the further you’ll be able to cast it. But always remember, to leave your ego at the dock. Spinnerbaits: spinnerbaits are a very effective lure when it comes to attracting pike. While retrieving your spinner bait you’ll want to retrieve it in a somewhat jigging motion, but make sure to pause your retrieval for a fraction of a second while passing any potential hideouts were a pike might be located. Floating mice/poppers: these work great directly over top of weed beds or lily pads. They’re ideal for those shallow water locations where a pike could easily be hiding out. One rule of thumb to keep in mind, the bigger the lure, the bigger the fish. Crank baits: one of the great things about crank baits is the fact that they have many barbed hooks making it extremely easy to effectively set the hook on the pike strikes. Crankbaits cause a considerable amount of disturbance in the water which is great for attracting pike due to their extreme sensitivity to water disturbances and can easily be achieved with crainkbait rods.